Long Acre East, between its junction with Pinfold and Dark Lane, will be closed from 9:00am on Friday the 22nd of June until works are completed due to urgent repairs. Please see the attached document for more information, including a map. A portion of Chapel Lane will be closed between the 26th of July and the 4th of September. Please see the attached document for further details. 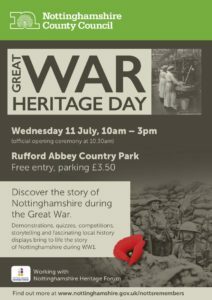 Discover the story of Nottinghamshire during the Great War. Please click the poster for more information. The planned roadworks between the Tithby junction of the A52 and Langar, which were scheduled to run overnight between the 22nd of June and the 25th of June, have been postponed. Please see the attached document for more information. Highways England is holding a residents meeting at Gamston Village Hall on Tuesday 19 June from 6pm to 7pm to discuss planned improvements to the A52 Stragglethorpe junction. For full details, visit the scheme web page. The car parks that serve Bingham’s town centre are owned and managed by Rushcliffe Borough Council. In the lead up to the car parking changes at Union and Needham Street, a survey of car parking use was conducted. The survey results somewhat surprised Bingham Town Council and other authorities as it dispelled the belief that our car parks were grid-locked by commuters travelling on to work by bus or train. The reality is that our car parks are used by people who work in Bingham. To create frequent parking turn-over, changes were made to Union and Needham Street in the knowledge that the impact would push long term parkers to Newgate Street. Changes to Newgate Street car park will only be considered once there is alternate long term parking. If changes are made without long term parking provision in place, the concern is that it will push long term parkers onto the residential streets in Bingham which would further exacerbate the challenges whilst driving in and through Bingham and frustrate local residents. Bingham Town Council has identified an area of land which could potentially be used as long term parking. We are currently working with Rushcliffe Borough Council to create access to this land and to overcome other obstacles which would make this land a viable long term car parking facility. This will all take time but once a new long term parking facility is in place, it will then afford Rushcliffe Borough Council the opportunity to alter the parking regulations in Newgate Street and it will provide the conditions for Nottinghamshire County Council to conduct a further parking survey to assess Bingham’s parking provision in its entirety to see whether there is a need for resident parking in certain areas of Bingham. We have just been informed that the fly-past by an RAF Dakota during tomorrow’s Bingham Summer Fair will now be at approximately 3:15pm.